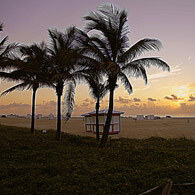 MIAMI BEACH: Cheap Hotels in Miami Beach Offer Ocean Views and Fun in the Sun! The famous Miami Beach seven-mile strip of hotels, restaurants, day and nightlife are more than enough reason to stay here. Add to that exciting day trips, like the Florida Keys and Everglades and you can be sure to have an exciting vacation. 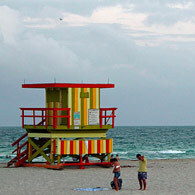 The best time of year to visit Miami Beach is between June and September, also the hottest time of year. Magic Savings Tip: People come to Miami Beach for the sun and warmth when it’s cold at home. Planning to visit the beach during summer months finds cheaper hotel rates and more availability. Just remember your high SPF lotion and hydrate. Walk the Boardwalk and visit shops, bars and restaurants. Then maybe stroll Ocean Drive, and zoom back in time viewing the Art Deco buildings from the 1920’s still looking the way they did back then. And no visit is complete without spending time on South Miami Beach, even if it’s just people watching. Keep a sharp lookout for celebrities because this is their play land. This may not be the place for a “family outing”, mainly because it’s where the attraction includes lots of scantily clad bathers there to see and be seen. Vacationing with youngsters, a visit to the Zoo Miami is always a great day out, and probably a good break from the sun and beach. If the children are old enough, why not look into some jet skiing, or maybe a day fishing charter. Another activity world famous is Scuba Diving on the Keys, where some of the best “wreck diving” in the world is available. If you’ve never Scuba Dived, don’t fret, they offer one-day discovery diving tours for young and old. You never know if you like it until you try it. There are so many dining experiences on Miami Beach to choose from, and here are a few of the most favorite by visitors. One of the finest experiences in dining overlooking the water is at Smith & Wollensky, with outside dining with a view and a premium steak, accompanied by a fine bottle of wine, you will surly impress the love of your life. Be sure to make reservations, and get there early for a cocktail at the outside bar. Be sure to try their Signature Crab Cake. They’re just yummy. With such a large Cuban influence in food in the greater Miami area, you shouldn’t leave without trying Cuban cuisine. One visitor favorite is Puerto Sagua on Collins, and their specialty dishes, Oxtail Stew and Ropa Vieja. For the traveler looking for some breakfast, a newspaper or just a good cup of coffee, the News Café is a super choice. For specific cuisine or just a recommendation, as always, your hotel staff can always provide excellent local suggestions. Take a drive down the Florida Keys, for the view, fishing or maybe Scuba Diving. Each ‘key” is unique and worth a stop for a few photo’s and a Rum Runner at the local hangout. Remember, the Keys were the favorite hangouts of Ernest Hemingway, and you can visit his “memorial” bar/hangout on Key West. Take a drive or tour bus to the Florida Everglades, and board one of the boat tours for an exciting adventure in the “Glades”. Be sure to keep your hands in the boat, because there are large teeth in those alligator choppers. A tour of both Monkey Jungle and Jungle Island (used to be Parrot Jungle), are each excellent day trips. See the exotic animals of Florida within a humane environment. When was the last time you had your photo taken with a large beautiful parrot on your shoulder, or a Spider Monkey in your arms? What does everyone do when they get to Miami Beach? Hit the beach of course. And what do they do at night? Hit the nightclubs of course. But what if you want to discover the other parts of Miami that not every tourist gets to see? Let us be your guide for your Miami vacation. If you're staying in central Miami Beach, you have the beach at your feet! Find cheap accommodation in Miami Beach and look for packages that include breakfast. If you're traveling with young children, make your first stop the Miami Children's Museum on the MacArthur Causeway Miami, Florida. It's ideal for young children with such exhibits as the Castle Of Dreams ( a two story sandcastle) and the giant piggy bank kids can walk through. There's a pet place where kids can learn how to look after pets and a health and wellness center to teach kids about health in a interactive, fun way. The Miami Art Museum is a great place to cool off for a while and take in the impressive art collection in genteel surrounds. The MAM is mostly concentrated on contemporary art and is located at 101 West Flagler Street in Downtown Miami. It's in the same area as the Miami Cultural Plaza and History Miami and the Miami-Dade Public Library. Historic Miami is a very river-centered story and you see it and hear on a Historical Jungle Tour down the Miami River. Essentially you climb aboard the boat at the Dupont Plaza Hotel Marina and take in the sights of modern Miami as you listen to tales of old, dangerous and violent Miami. 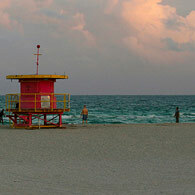 Find Cheaprooms.com accommodation in Miami Beach and enjoy the undiscovered side to this great city. 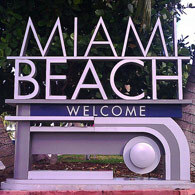 The weather's warm, the beach is hot, the nightclubs are pumping; no wonder Miami Beach is a lover's dream destination. Find Cheaprooms.com accommodation in Miami Beachand enjoy a perfect stay in one of the world's great romantic destinations. Miami Beach means South Beach for many people. And especially lovers! Why, because this is where the twin worlds of night and day in the form of exciting clubs and restaurants and beautiful beaches to soak up the sun and recover the next day collide. If you could stay awake for 24 hours, South Beach Miami will find you something to do every moment. While you're cruising Ocean Drive you'll not miss the amazing art deco architecture of so many of the buildings. And it's not just the lovely pastels that every building offers; it's the sheer genius of the original developers who made Miami Beach what it is today. Originally a swampy, mangrove area of coastal humidity, John Collins and Carl Fisher gradually transformed the place, building by building in the early 1900s. If you have a couple of days to spare, consider a day trip to the Everglades. It's an adventure trip a couple won't forget in a hurry and the wild wildlife (think alligators, panthers, snakes and predator birds) is stunning if you're lucky enough to catch a glimpse. For a romantic start to the evening check the sunset from South Pointe park. So much to see - so little time - isn't that always the way! Oh well. At least you're on your way to Miami Beach - but what to do and see in limited time? Let us help with a few suggestions. 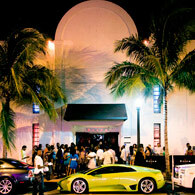 See Cheaprooms.com first of all and find a budget room in Miami Beach and get ready to par-tay! More than 550 hotel choices means there is something for every budget in Miami Beach. Find cheap accommodation in Miami and get ready to shop, bop and relax! South Beach in Miami is that delightful blend of clear blue waters and golden sands, plus a beachfront party area second to none. You can relax by day and then take on the nightclubs by night. Even if you're not a nightlife fiend, South Beach's lovely art deco architecture and the hundreds of quirky boutiques and full scale shopping destination stores will satiate your every appetite. The pastel colors are indeed quite special and give the area a suitably glamorous look. If you've packed the kids for the big Miami trip, can we suggest the Miami Museum of Science? There's something here for the whole family and the hands-on nature of the place plus the staff make for a special day out. The museum is home to the Bird of Prey Research Center and the Weintraub Observatory. Miami's unique wildlife is quite different to that found in the rest of the country. The center also runs annual events including Snake Day and Lizard Day. Zoo Miami just gets better and better - even for non-zoo type people. Essentially the animals are kept as free range as possible and the county's climate enables the more exotic animals from Asia, Australia and Africa to live in relative climate-comfort. Animals are grouped by geographic locality and in an extra twist, animals who live peacefully in the wild together are kept together in Zoo Miami. The beautiful beaches of Miami are one thing - but what do you do with a bunch of kids in tow? Get wild - at the Miami Seaquarium and Miami Zoo! Check Cheaprooms.com first of all and find a room in Miami Beach and make your next Miami Beach vacation a wild one. There are more than 550 hotels in the Miami Breach area so choose on the basis of where you'll spend the most time. Close to the beach is pricier and even just one block back results in dramatically lower prices. Find cheap accommodation in Miami Beach and have a great time with the kids, spending more on activities than accommodation! The Miami Seaquarium is a world-class facility on the Rickenbacker Causeway with views back to the Miami skyline (this is particularly spectacular at night). The Seaquarium covers more than 38 acres and has all the good stuff like dolphins, killer whales and sea lions. It's set amongst beautiful parklands which make for a great lunch time break. Our tip; pre-book the Sea Trek Reef Encounter. Zoo Miami is one of the country's great zoos. There are more than 2,000 creatures, critters and furry things. The park-like setting also means you get to see a range of tropical plants and trees. Some of the weirder creatures include the Australian Tree Kangaroo, the Caribbean Flamingo, the Emerald Tree Boa and the Orinoco Crocodile. You're close to South America in downtown Miami... so why not see what the real Amazon looks like at the Zoo Miami exhibition. There are 600 South American animals on display and you can check out giant river otters, six-foot jaguars an d giant eagles - as well as the largest snake on earth - the South American Anaconda. Everyone loves a beach vacation and Miami Beach offers a fabulous one. Go to Cheaprooms.com and get yourself to Miami with a cheap hotel package to suit your budget and family needs. There's endless entertainment here and activities every day and night of the week. The place oozes charm, sophistication and endless entertainment. Find cheap accommodation in Miami now and let the excitement begin! South Beach is where it all really happens, and taking the teens out for a (relatively) sophisticated meal followed by a stroll along the oceanfront walk will cause their cool meters to go through the roof. They'll see celebrities wandering in and out of the oceanfront terraces and living it up on the roof top bars. Unfortunately, your teens won't get to venture into said roof top bars or glamorous clubs, so they'll have to make do with the rest of Miami's adventurous possibilities. Not the least of which is flying... Ultralight Flying. You'll get a birds eye view of the city from an Ultralight at the very reasonable price of $70 for a 15 minute flight. Soar above the city and the beach and watch the ocean swell rolling in. Rent a convertible and take the kids cruising down Ocean Drive past the incredible art-deco repository of history that is South Beach. The freshly-painted pastels and neon look amazing. Stop for breakfast at the Front Porch cafe and treat the kids to pancakes and French Toast. Just 15 minutes east of South Beach is Little Havana where you can watch cigars being rolled by hand and fresh tamales and churros are on sale from various street vendors. Or you might like a more substantial - and very Cuban - meal of pork, rice and beans. When travelling with kids, the first thing to do is know what activities are waiting for you at your preferred destination. There's plenty for families to do in Miami, even apart from the beach, so check Cheaprooms.com and get yourself to Miami Beach with a cheap hotel packageto suit every budget and every family. The glorious South Beach area drags everyone down to Florida's favorite tourist hotspot, but check the weather forecast for Miami Beach before you come so you know what to pack for. Find somecheap accommodation in Miami and get ready to enjoy all there is in this vacation heaven. You might like to think outside the square next time you're in Miami... how about taking the kids on a exploration through the Everglades? This magical, mystical 'jungle' is right on Miami's doorstep, yet so few people explore it. You can do completely safe guided tours and see wild critters up close in this glorious tropical wilderness. If the weather turns in one day, check out the Miami Museum of Science. It's oh-so-cool for kids with plenty of hands-on exhibits and 3D displays and more. There's an observatory there and the Bird of Prey research center which is fascinating for teenage boys! South Beach itself has plenty of adventure sports for the teenagers in your family. If they're getting bored, look out for the parasailing, the learn-to-surf schools and the boogie board riding comps. The Miami Children's Museum is a very cool place to take the medium-size kids. They can interact with many of the exhibits and they'll explore different worlds (for them) like a supermarket and a television station with a whole bunch of 'behind the scenes' stuff.